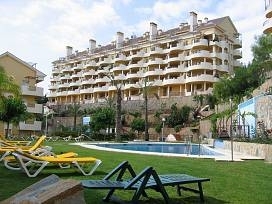 Our apartment is on an elevated site offering breathtaking views over the surrounding coast and mountains. 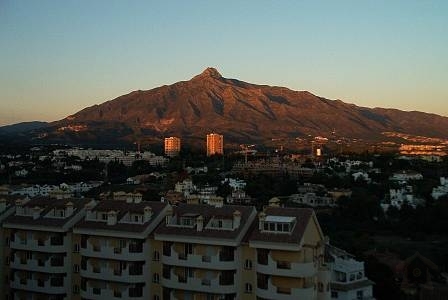 From here you can see the Mediterranean Sea, Golf Valley and La Concha peak of the Sierra Blanca Mountain. The large terrace is perfect for al-fresco dining while enjoying these spectacular views. There is also a smaller terrace off the main bedroom that catches the evening sun for those romantic evening cocktails. The luxurious accommodation comprises of 2 bedrooms, 2 bathrooms, fully fitted kitchen and a bright lounge with patio doors leading onto the main terrace. The apartment is fully air conditioned and has the added convenience of underground parking with a lift to the front door. 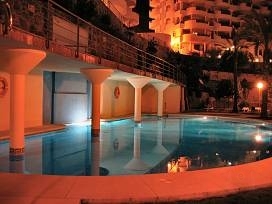 It is set on a private complex with landscaped gardens, three swimming pools, two children's pools and paddle tennis. Puerto Banus, which is renowned for its sandy beaches, fashionable shops, magnificent yacht marina, international restaurants and bars, is only a 10-15 minute walk away. Just a few minutes walk from the complex there are supermarkets, restaurants, bars and a variety of other shops. The bull-ring is also close by where there is a fantastic market on Saturdays. For Golfers, there are many internationally renowned courses near by. Imagine playing golf surrounded by a mountainous backdrop and stunning scenery. 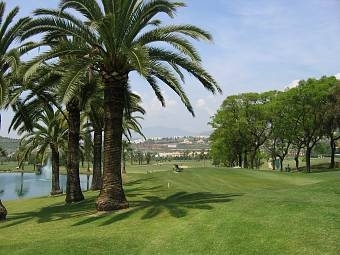 The courses include; Los Naranjos Golf Club, Golf la Dama de Noche, Real Club de Golf las Brisas, Aloha Golf Club and La Quinta Golf & Country Club. The vacation rental apartment is conveniently situated in Nueva Andalucia which is only a 30-40 minute drive from Malaga airport. 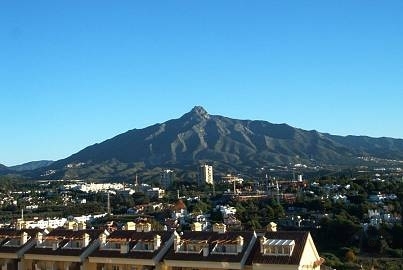 Within a mile is the fashionable Puerto Banus and the popular resort of Marbella is less than 4 miles away.